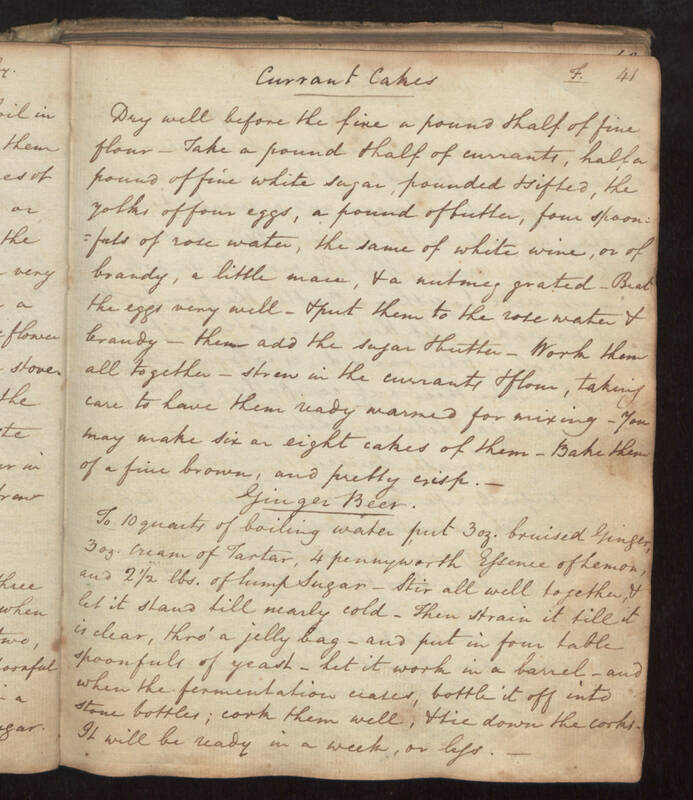 41 Currant Cakes F. Dry well before the fire a pound & half of fine flour - Take a pound & half of currants, half a pound of fine white Sugar, pounded & sifted, the yolks of four eggs, a pound of butter, four spoonfuls of rose water, the same of white wine, or of brandy, a little mace, & a nutmeg grated - Beat the eggs very well - & put them to the rose water & brandy - then add the sugar & butter - Work them all together - strew in the currants & flour, taking care to have them ready warmed for mixing - You may make six or eight cakes of them - Bake them of a fine brown, and pretty crisp. Ginger Beer. To 10 quarts of boiling water put 3 oz. bruised Ginger, 3 oz. cream of Tartar, 4 penny worth Essence of Lemon, and 2 1/2 lbs. of lump Sugar - Stir all well together, & let it stand till nearly cold - Then strain it till it is clear, thro' a jelly bag - and put in four table spoonfuls of yeast - Let it work in a barrel - and when the fermentation ceases, bottle it off into stone bottles; cork them well, & tie down the corks. It will be ready in a week, or less.